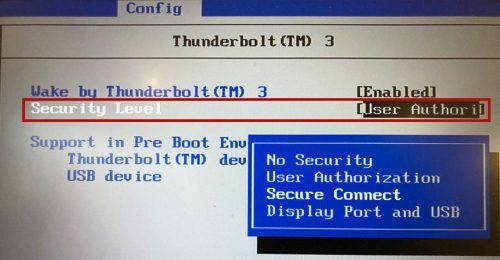 Thunderbolt security has been in the news recently: researchers presented a set of new vulnerabilities involving Thunderbolt which they named Thunderclap1. The authors built a "fake" network card2 and performed various DMA attacks and were able to temper with memory regions that their network card should have no access to whatsoever. In some way this is not all that surprising because the foundation of Thunderbolt are PCIe tunnels to external hardware and one of the reasons that PCIe is fast is because it can do direct memory access (DMA). Use boltctl domains to inspect the current security level. The current primary defense against DMA attacks for Thunderbolt 3 are the security levels: if enabled (the default on most systems) it gives the software the ability to decide on a per device level to allow or deny PCIe tunnels (and with that potentially access to all the memory via DMA)3. While not protecting from DMA attacks per se it protects from some — maybe the most — prominent threat scenarios4: 1) somebody plugging that evil device into your computer while you are away or 2) you have to plug in a device into your computer that you don't trust, i.e. a projector at a conference. On GNU/Linux boltd will authorize a plugged-in device only if an admin user is logged in and the screen is unlocked. For untrusted environments the authorization by boltd can be disabled entirely, e.g. when you go to a conference, via the GNOME settings panel. The toggle is called "Direct Access" (see screenshot below). The panel has a global switch to toggle all authorization performed by bolt. This is not the full story though, because there is a second way to prevent DMA attacks utilizing the input–output memory management unit (IOMMU). The general idea is to assign a specific memory region to a device which is the only area the device can directly access. Mika Westerberg from Intel has worked on kernel patches (will be in 5.0) to use firmware supported IOMMU virtualization (Intel calls this VT-d) which should make DMA attacks harder. Having said that, Mika was pointing out (thanks!) that there are still two possible issues mentioned in the paper that are not yet addressed (I paraphrase Mika): 1) IOMMU window size granularity is such that it may open a "too big" IOMMU window and 2) IOMMU mappings are not immediately torn down, leaving memory exposed for some time. Intel (Lu Baolu) is working on patches to mitigate those issues. On the bolt side of things, I have recently merged MR!137 which adds the necessary IOMMU plumbing. The big caveat for this is that it needs hardware/firmware support and for most (all?) currently shipping systems we are out of luck. Security levels and IOMMU based DMA protection are orthogonal and the way support is implemented in Linux 5.0 is that userspace (bolt) is still required to authorize devices (if the security level demands it, i.e. user or secure). This means that you still have the ability to globally disable authorization of any device, e.g. for when you go to a conference. Thunderbolt 3 Security Levels in the BIOS: Enable at least "User Authorization"
To sum it all up: For now, make sure you have Thunderbolt 3 security enabled in the BIOS and whenever you are in an untrusted environment (e.g. conference) disable device authorization completely (via the Settings panel). In the future, with Linux 5.0 and new hardware Linux will also get IOMMU based DMA protection that should greatly reduce the risk of DMA attacks and work is underway to plug the remaining known issues. The paper states that situation for Linux is: "patches for approval of hotplug devices have been produced by Intel and distributions are beginning to implement user interfaces." So this is not super up to date (long paper review process I guess). The current situation is: kernel level support landed in 4.13; bolt was included in Fedora 27, RHEL 7.6 and is now included in many distributions. IOMMU support will land in 5.0 (but see the text for remaining issues). Assuming that you trust manufacturers of hardware (attacks can also happen at the "supply chain").